Buying a place is probably one of the single biggest decisions I’ll ever make. And it’s So. Damn. Complicated. Is buying as “good” of an idea now as it was in 2006 or 2011? Is property in my area overvalued? What’s the inventory available now say about the future market? Can HOA fees really push you over the edge? When’s the next property tax hike (inevitably) coming? It’s hard to tell if the costs of owning—realtor (and lawyer and inspector) fees, mortgage interest, property tax, repairs, etc.—outweigh the financial benefits. Luckily, the New York Times has created a nifty little tool to help shed some light on the gray areas. You fill in the details like home price, how long you plan to live there, closing costs, growth rate, homeowner’s insurance, etc. 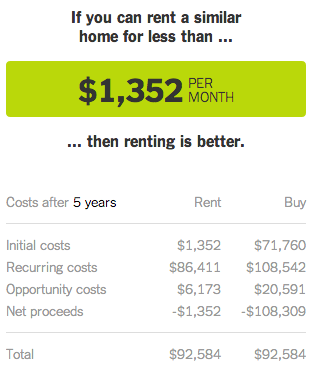 It even takes into account renting costs, like security deposit and renter’s insurance. Then you arrive at Your Number: If you can rent a similar home for less than X, then renting is better. 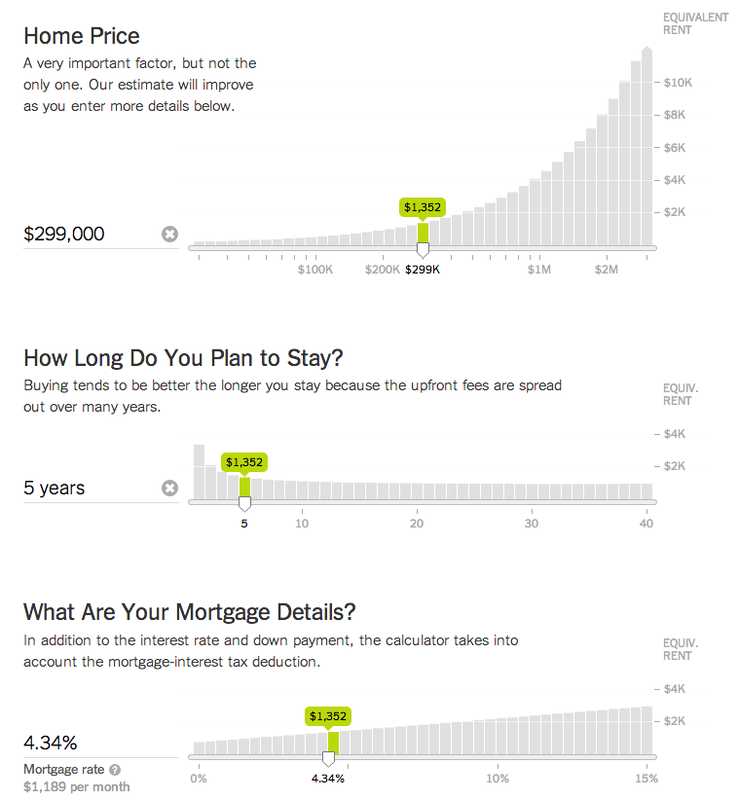 How Much Money Do You Have to Earn to Buy a Home? Big news guys: I’m meeting with a realtor tomorrow! OK, it’s very, very, very preliminary, but I’m happy that I’m being proactive about it—and there’s the added bonus of crossing something off my 2014 To-Do List. Basically I just want to figure out if it’s feasible for me to even be thinking about buying a condo or if I should scrape together ever penny for the next year and try again then. Is it a good time to buy? How much do I have to put down exactly? Why are HOA fees so friggin’ much? I don’t know about you, but this seems extremely low. Then again, I live in a relatively clean, violence-free and accessible part of the city, and that’s generally where I’ve been stalking places on Zillow too. We’ll see what the realtor has to say. A 2BD/2BA for $187K? I could do that—but I doubt she could. See the dets for other cities here.